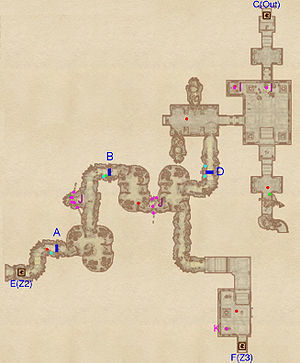 Gardens of Flesh and Bone is a large cave located inside The Fringe; initially inaccessible, containing monsters (quest-related). It contains four zones: Gardens of Flesh and Bone, Natatorium of Wound Bled Tears, Conservatorium Corpusculum, and Caverns of Susurration. You may visit the exterior with Jayred Ice-Veins during the quest Through the Fringe of Madness. You can only enter The Gardens of Flesh and Bone with the Key to Sanctum and Gardens given to you by Relmyna Verenim during the quest Rebuilding the Gatekeeper. Once the main quest is complete the entrance door is relocked. It can be unlocked with the same key as above. This cave contains 3 Rot Scale plants, 8 Thorn Hook plants, 22 Root Stalk plants, and 196 Withering Moon plants. 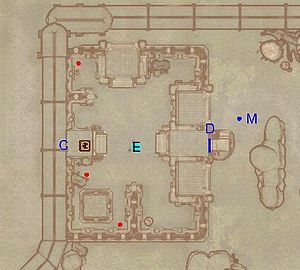 This location's map marker (M on map) is named Gardens of Flesh and Bone (editor name XPGardensMapMarker). The entrance door is W of the marker, 160 feet away. Your main objective is the four essential components of true Flesh needed for the Gatekeeper ritual, which are spread throughout the four zones. 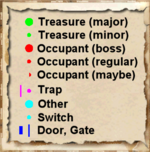 In the first room, beware of the two cave in traps at I that will trigger the moment you set foot inside. Explore the room to the south and then proceed southwest to find yourself in a typical root cave. Remove the twisted roots (D) by activating the Pull Pod (cyan dot on map) and take left at the intersection to arrive at door F, leading to Conservatorium Corpusculum. Even if you were to brave the root spike traps at J, the roots at B prevent you from continuing. You will return to this zone from the Natatorium of Wound Bled Tears, through door E. Simply make your way back to the exit, activating the twisted roots at A and B as you go along. Make sure you don't miss the Hollowed Stump in the small alcove between the two roots, completely surrounded by the root spike traps at J; which forces you to jump over these to reach it. Upon entering from Caverns of Susurration through door G, you'll be immediately be attacked by an Atronach, so take care. 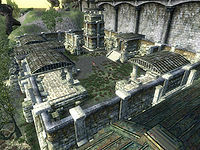 At the first intersection, go straight ahead for a major detour through a ruin-like structure. Head to the final room, and be careful as a hunger statue (L) shoots at you repeatedly, no matter where you stand. Opening the minor loot chest in front of it will make the gate behind you shut tight, with a Very Hard Lock on it. 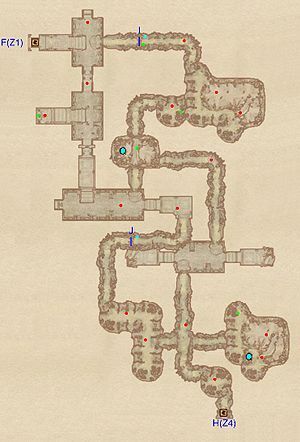 Either pick the lock or risk your life by locating the button on the other side of the altar (cyan dot on map), which will unlock the gate. After heading back to the intersection, taking the northern tunnel and braving the numerous root spike traps at J and a cave in trap at I, you will arrive in a large chamber. Head south down the stairs, minding a cave in trap at I, and dispose of the enemies guarding the chest on the altar. The altar has three different buttons: the eastern one will trigger another cave in trap (I) and the western one will make the four Hunger Statues at K shoot at you. The button facing the door is the way to go, so activate it and press south until you arrive in blood-soaked room where you can claim the Blood Liqueur at Q. Make sure to loot the boss chest at B on the way. Go back on your steps and locate door E leading to the first zone, Gardens of Flesh and Bone. This zone contains two of the components but can be quite tricky to navigate. Upon arriving from Gardens of Flesh and Bone from door F, you will find the eastern path through the broken wall is blocked by twisted roots (I), so the metal door to the south is the only option. Head north up the rubble at the next intersection and cross the bridge above the first component, the Dermis Membrane (Q). After exploring and looting the area, you will eventually end up at I, although you are now able to open the roots. Return to the bridge over the Dermis Membrane and jump down to claim the component. Head south and take left at the three-way junction: here is the second component in this zone, the Osseous Marrow (Q), and two enemies guarding it. Backtrack to the intersection and head south towards door H, leading to Caverns of Susurration. The Caverns of Susurration is a large, multi-layered labyrinth and is incredibly hard to navigate due to the numerous twisted roots that will only bend if you approach them from the correct side. Additionally, they will close again after you have passed them, which will prevent you from backtracking. Fortunately, your main objective in this zone, the Essence of Breath, produces a glowing mist that will always lead you in the right direction and eventually land you near your target. If you want everything, however, it is necessary to take a few detours. 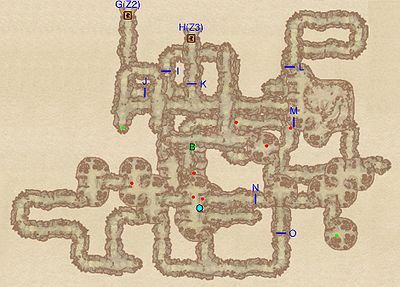 Upon entering the caverns from door H, open the first set of twisted roots (K) and head right to loot the Hollowed Stump in the corner (green dot on map). Go back on your steps and follow the mist until you reach an intersection guarded by a Hunger. Ignore the mist and head left to loot the second Hollowed Stump of the zone. Return to the intersection and follow the mist through the roots at N. Avoid any detours, although if you do lose your way, simply stand still and wait for the next spell of breathing to get back on course. The mist will then lead you through the roots at O, M and I until you finally arrive in the chamber with the Essence of Breath; which is guarded by three Hungers. Wait until the mist has filled up the bottle, then claim the component. Loot the boss-leveled Hollowed Stump at B, then head back out, pass the last set of twisted roots at J and you'll finally find yourself at door G.